Despite remembering how annoying it was to hear it as a kid, I still nag my kids about the importance of practicing a new skill. There may be some debate about how much practice is needed to learn a particular task, but there’s little doubt that our brains learn through repetition, piecing together the right and wrong way to do something each time we attempt it. This might not be terribly motivating if you’re feeling frustrated with your piano or swim practice though, especially when you feel like your practice isn’t making any difference in your abilities. As it turns out, there may be a faster way to learn a new skill, although it as some annoyed zebra finches learned, it comes with cost. Songbirds like a zebra finch (Taeniopygia guttata) are born with the anatomy to sing, but they don’t instinctually know the repertoires they’ll perform throughout their lives. They must learn particular songs, and seem to rely on listening to their older relatives, building their own version of a tune over time. Some songbirds have more direct mentors for their singing, but they can also piece together a song on their own if need be. These two styles of learning allowed researchers from the University of Zurich to devise an experiment to see if one kind of learning was more advantageous than the other. Essentially, do the finches who learn by example do better than those that have to figure things out through trial and error? While zebra finches definitely learn songs from each other, the first part of the experiment needed the birds to actively compare songs they were listening to. Birds were tasked with learning to differentiate between either “long” or “short” songs. 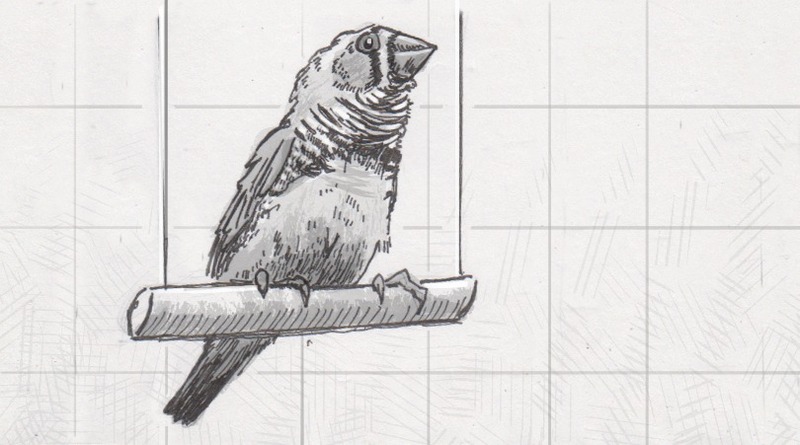 Half the birds could observe other finches work through the same process, while the other half were left to figure out the comparison on their own. This made a huge difference, as birds that could learn from the efforts of their peers could successfully compare the songs after only 900 attempts, while birds who had to work on their own required closer to 4,700. Clearly, the social nature of zebra finches gives them a huge boost, allowing them to benefit from the efforts of other birds. A second phase of the experiment found that the apparent advantage of social learning might not be better in every circumstance though. After learning the long and short songs, finches were offered a perch where they could see other birds but listen to two other recorded bird songs. These songs were similar to what had already been practiced, except that the longer song in this case was followed by an unpleasant puff of air in the listener’s face. Researchers then tracked how long the finches took to learn this new association and be ready to move their head out of the way of the harmless but annoying negative reinforcement. The finches that learned from their peers in the first phase of the experiment didn’t fare as well in this scenario. On average, they took 3,600 tries before they put together the clues about when they’d be puffed in the face. The birds that had to figure out the first phase on their own did significantly better, requiring only 800 tries to learn this new task. So while they took longer to figure out the songs on their own, these birds seemed to have a better grasp of the underlying concepts which allowed them to generalize and reuse those ideas in new situations. We can’t necessarily say that all learning can be compared to a zebra finch trying to avoid a puff of air in its face. However, researchers did put together a model that could help explain how these two sets of behaviors work on a neurological level. They believe that the finches that learned the first task by watching peers probably ended up with a broad but relatively weak set of synaptic connections associated with comparing the songs. In addition to forming connections in their brain that helped them listen to different song structures, they may have also been recording less relevant information, such as how their peers were sitting, if it was time to eat or not, etc. All that left them with a good blueprint for that first scenario, but it fell apart when too many of those irrelevant details were changed. In contrast, the birds that had to figure out the first songs on their own probably retained fewer details, but had a more robust foundation to build on in the second phase of the experiment. They likely had fewer synaptic connections in their brain, but what they had was strong and ready to work with new information in a more useful way. None of this diminishes the need for practice. Many schools purposely try to use both forms of learning, asking students to both mimic a tutor and spend time in more experimental, trial-and-error activities. The former may help get someone up to speed a little quicker, which is great for a sense of accomplishment, but it turns out those difficult periods of more iterative learning will likely lead to a deeper understanding of an idea for future use.